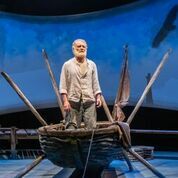 Review of Hemingway’s The Old Man and the Sea, adapted for the stage by A.E. Hotchner and Tim Hotchner. Pittsburgh Playhouse, February 8, 2019. The REP, the professional theater company of Point Park University, staged A. E. and Tim Hotchner’s adaptation of Hemingway’s The Old Man and the Seathis past month (February 2019). The venue was the intimate Highmark Theater of the new Pittsburgh Playhouse complex in downtown Pittsburgh. Papa sold out in the Burgh—quickly. I couldn’t get a ticket and had to get in as a wait list entrant at the final moment before a Friday night performance. I found a seat in the front row as seating was general admission. The first thought that came to mind when I heard that The Old Man and the Seawas going to appear on stage was “Well, how are they going to pull that one off?” How do you depict deep-sea marlin fishing and shark attacks on stage? Perhaps more than other arts, theater involves multiple artifices that the audience must accept. The Old Man and the Seawould have to use plenty of artifice just to tell the story, so I wondered: how would it avoid becoming artificial? The answer in this case is not to hide the artifice, to own it, to show it up front, allowing the audience accustomed to it. That way when the big emotional moments come, the audience will not have to sort out some new technical distraction. Video design plays an important part in setting the mood as well as indicating the time of day. Three canvasses, looking like sails, cover the rear of the stage. Onto them are projected mostly seascapes and skyscapes, both with birds. A shadowy memory of Santiago’s wife dancing appears momentarily, suggesting his fading memory of her. The lions Santiago dreams of are appropriately washed out and grainy, suggestive of dreams or distant memories. In front of the canvasses is a curved pier, about three feet high. Santiago’s boat juts out from the center. Far audience left is a wooden crate suggesting Santiago’s shack where he interacts with Manolo. Far audience right and raised above the pier is Hemingway’s writing room. Indeed, the presence of Hemingway himself as a character in the play becomes part of the artifice, one that I found very easy to accept from the start. He and Santiago finish each other’s sentences, and Hemingway reads key parts of the narrative, as well as transition passages. Hemingway also assists with stage transitions. The theater floor around the boat is lit to suggest water moving. Later, as Santiago leans out with his harpoon and then an old baseball bat to strike the floor, red lights spread across the floor to suggest the blood of the marlin and of the sharks. The cellist Simon J.C. Cummings, who composed the musical score, is on stage from the start, incorporating the artifice of the musical accompaniment into the performance. He fingerpicks with the cello across his lap like a guitar much of the time, at least once picking to what I took to be a recorded shuffle beat backing him. He switched to the bow for more volume in more dramatic moments. At one point Hemingway places a chair for him right in front of the prow of Santiago’s boat. For that scene, he calls up bird sounds from his cello as he represents the bird with whom Santiago has a dialogue, a delightful light moment that works well on stage. Notably, Ernest himself played the cello himself during his school years, although he never quite mastered it. Manolin is portrayed as a young man, and when he is called “boy,” it is not pejorative as it easily can be in English. Gabriel Florentino looks convincingly Cuban and interacts well with Tony Crivello’s Santiago. The script does not give him much contact with Hemingway. A little of Hemingway’s life makes its way into the play. There’s a reference to the Pilar and a brief passage from A Moveable Feastabout Hemingway’s early life in Paris, but the play fortunately does not round up the usual clichés about Hemingway’s celebrity persona. David Cabot’s Hemingway is Hemingway alone in his writing room, pounding the keys and jotting down dialogue in his notebook. Without the celebrity baggage, Cabot plays Hemingway simply as a writer in his writing room. Cabot also has a comic moment. During the baseball discussion Manolin asks whether Luque or Mike Gonzalez is the better manager. When Santiago answers that they are equal, Hemingway from the far side of the stage sighs and waves dismissively at Santiago’s assessment. During the arm wrestling sequence, Santiago wrestles with Hemingway, and Manolo serves as referee and as ringside announcer. He declares Santiago champion, which is echoed beautifully at the play’s ending. In the arm wrestling sequence, Hemingway faces himself when he faces his creation. Often his advice to Santiago could double as advice to himself. That aspect of the play is certainly not belabored. Artifice continues in the hooking sequence. Hemingway leaves his perch and pulls the hook and line out from the prow of Santiago’s boat, fastening it under the first row of seats. When the marlin circles, Hemingway walks back and forth with the line. The initial nibble and setting of the hook are the most dramatic moments in the marlin sequence, with Santiago jubilant on his boat and on either side of him Manolin cheering and Hemingway shouting instructions. The grueling hours Santiago spends in his fight with the marlin are depicted but not emphasized during the performance, nor is the kill sequence. Grueling hours are better depicted in novels than on stage. Thankfully, no stuffed marlin or mechanical sharks are dragged onto the stage. A stuffed marlin isn’t necessary because everybody knows the story. It’s iconic. Santiago simply ties a spar to the side of the boat to represent the marlin. By the second half of the play, the audience has already processed the meaning of the artifices and accepts their function without being distracted by them. Tim and A.E. Hotchner have not written a play about marlin fishing. They have written a play about human emotions: determination, jubilation, exhaustion, depression, triumph, despair, loneliness, rage, regret, and resignation. The theatrical team, the crew, the cast, the lighting techs, the sound techs, and the cellist have opened a hole through the audience’s collective heart and handed Tony Crivello the ball. He runs with it, portraying each emotion with subtlety and, indeed, grace under pressure. Crivello looks robust enough during the fishing sequence and fragile and stiff enough when he wakes. He’s believable and moving as Santiago. The program credit list for him does not mention King Lear, but I think his window for that role has opened. His portrayal of Santiago shows that he can convincingly play a man older and less robust than himself, but he also shows himself able to play a physically stressful role like that of Lear without exhaustion and stress during the process. David Cabot as Hemingway and Gabriel Florentino as Manolo do a fine jobs with their parts, and cellist Simon J.C. Cummings does so as well. All three are all Pittsburghers, so I do not know whether they will go with the play when or if it moves on. But such are their parts that I believe others could pick up the roles. An actor like Anthony “Tony” Crivello is another matter altogether. It’s difficult to imagine someone else taking over the role. I do not know whether the Hotchners wrote the part especially for him. If they did, I would not be surprised. Much went into this production, and if you have the chance to attend, it is worth seeking out.